When’s the last time you went shopping because your fridge was empty and your cupboards bare? Sure you may have said the other day, “My boys eat everything.” I’m sure they do. But I mean really empty. The empty kind you shut the fridge door because of the dirt you have no idea how it go there. Our culture craves more. We crave routine and grocery shopping is something we all do. Look at how popular grocery pickup is becoming? When did we stop checking our cupboards to see what we have before we go out and shop? If you need to save money fast, this is your answer. Using what you have before you buy new is a very easy concept. Yet it’s hard for us all to put into place all the time. Our mindset gets used to enjoying a certain snack for example and when it’s gone we need to buy more. 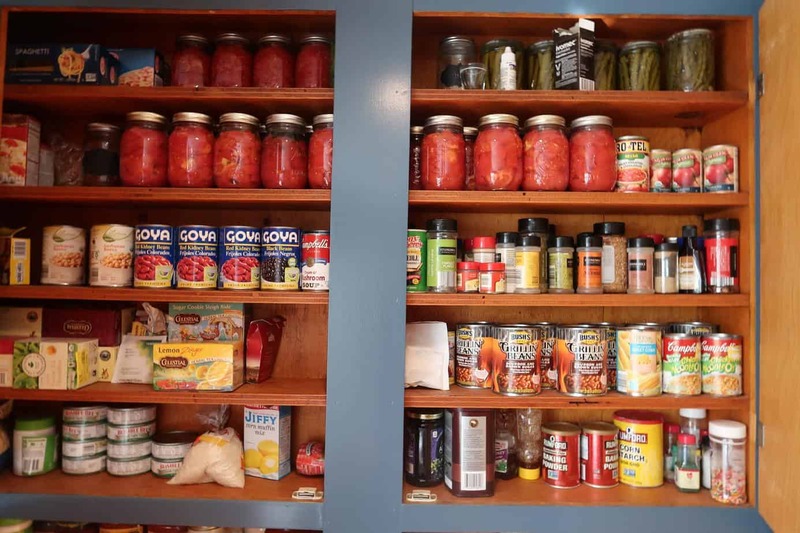 What happens when all those, we need more result in an overflowing pantry? We keep on spending money and think about how we wish we had more money. Believe that you can save money fast and you will. Give yourself an extra boost in the budget this week by not having to buy a ton of groceries. 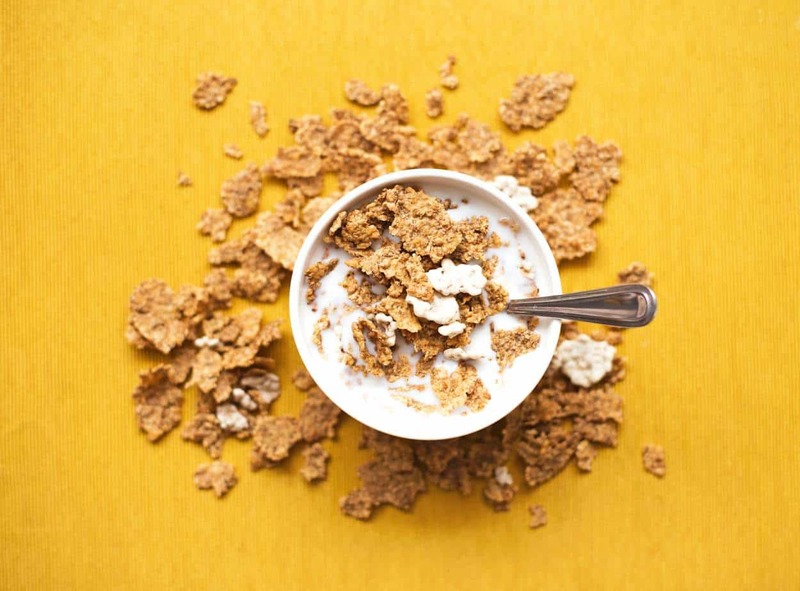 Why Use What You Have in Your Pantry? I like to compare eating up what’s in your pantry to a spending freeze. We went on an extreme spending freeze for six months. Using what you already have and pantry staofes was a key part to a successful spending freeze. Why do a spending freeze when you’ve reached adulthood and can buy/spend your money on whatever you want? Well, because somewhere down the road something happened and money may be tight. Or you may be feeling overwhelmed with the amount of stuff you have. It’s been almost three years since we did our major spending freeze. I’m talking about a six-month spending freeze friend. It was brutal. It was life changing and I would NEVER give up that experience. Our spending freeze jumpstarted the idea we could pay off our mortgage and continue to live debt free. Our spending freeze reminded us we could live below our means and save the rest. That spending freeze was the starting point to three years later we paid cash for an SUV, something I’m still in awe over. Our Spending Freeze post is still the number one viewed post on the site. I wrote it as we were going through it and updated it after it was over. Now that I’ve been a prime shopper to BJ’s Wholesale club I have a lot of snacks for the kids all at one time. Sure I will still scan the Tops coupon matchups list weekly because there are some items you just can’t get at BJs. And although I am a huge lover of shopping at BJs, they do have some items you shouldn’t buy there. Bulk snacks require storage. In our first home, we didn’t have a pantry. We used a door hanger and our only closet that also had towels for the bathroom. If you have kids you know as they grow so do the requests for food. 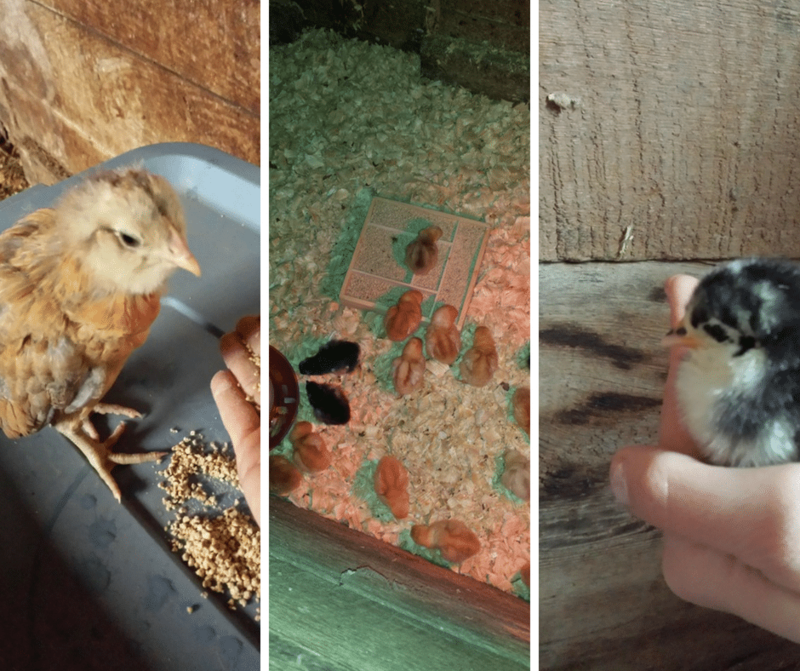 If I was feeling overwhelmed my kids were too. I realized they had too many options. And they needed to stop seeing the same snacks over and over. I declared a Pantry Spending Freeze. Although it is not a full-on spending freeze my goal for the next two weeks is to not buy any food until we use up what we have. Food can easily be something we keep buying and shoving away. Whether it spoils in the fridge before we get to use it or we just bought it because it was free or too cheap to pass up. Food is the one thing we probably take for granted in our country and the one thing we have endless options. I’ve always said since day one if you need to save money or increase your weekly income start with your groceries. It’s the one variable. Do you really have to have steak, chicken, and sausage this week? Do you really have to eat out two nights a week because of your schedule? The answer is no. There are ways to feed your family for less in every family and situation. Tell yourself that right now. Any excuses that are starting to form push those aside. Say out loud right now, I can feed my family for less. Remember you don’t have to feed your family for less for the rest of your life. There will come a time when the budget will be a little bigger and you can splurge a few nights a week. Just focus on the now and remember there is a bright future in place. Every step you are taking now is getting you to financial freedom. I wish someone reminded me of this when we were completely broke. It was actually our spending freeze that was a game changer for us. Realizing how we could live with little and discipline in your finances brings many blessings. The first thing you need to do is take an inventory of your pantry items. You could include items from your fridge and freezer if you want too. I’m focusing on my dry goods and freezer items. Throw out anything that is expired. Just do it. I hold onto it and say I’ll use it I will but years go by. 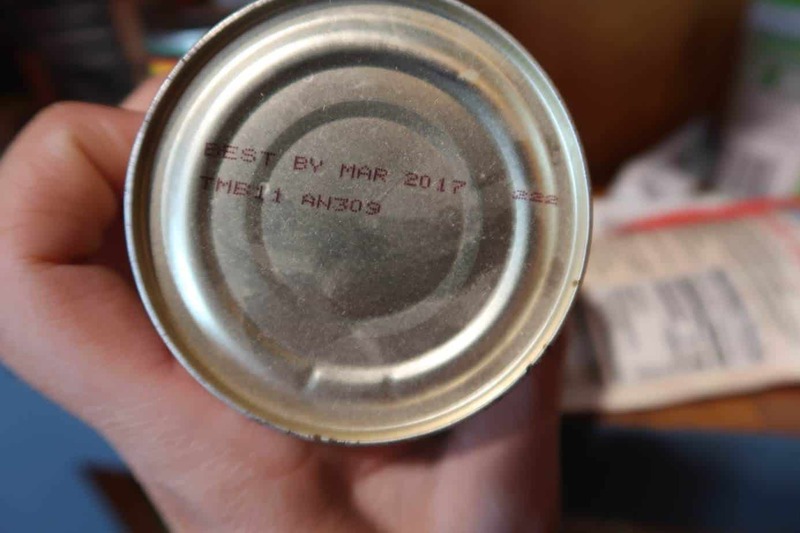 I had other cans from 2015 I cleaned out last winter and kept this one, thinking I would use it. List every item you have and how many if there are multiples. In our pantry since I’m a bulk shopper, I have a number of the same items. This is typical of any couponers pantry as well because you stock up on items when they are at their lowest price. After taking an inventory you will want to put your goods back in an organized way. I pulled everything out and then put items in by category. I chose six categories. You can choose whatever ones work for you. 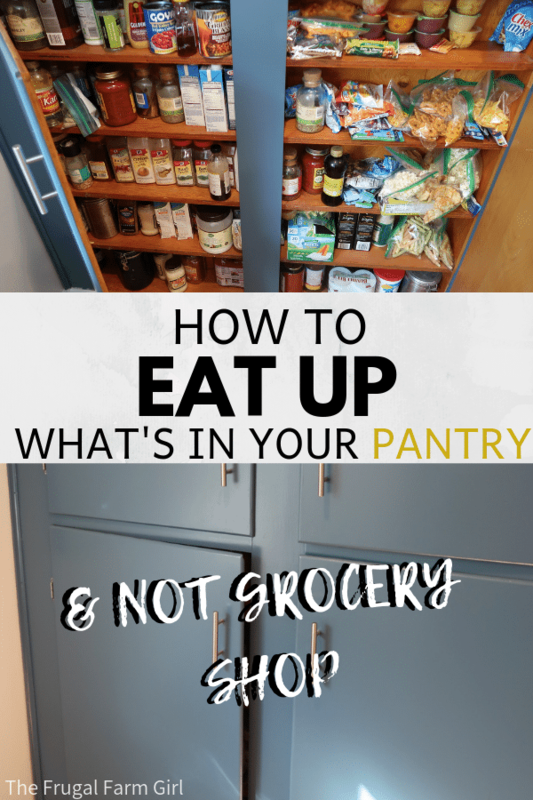 It will make it easier when you are meal planning if there is some sort of reason for your pantry. 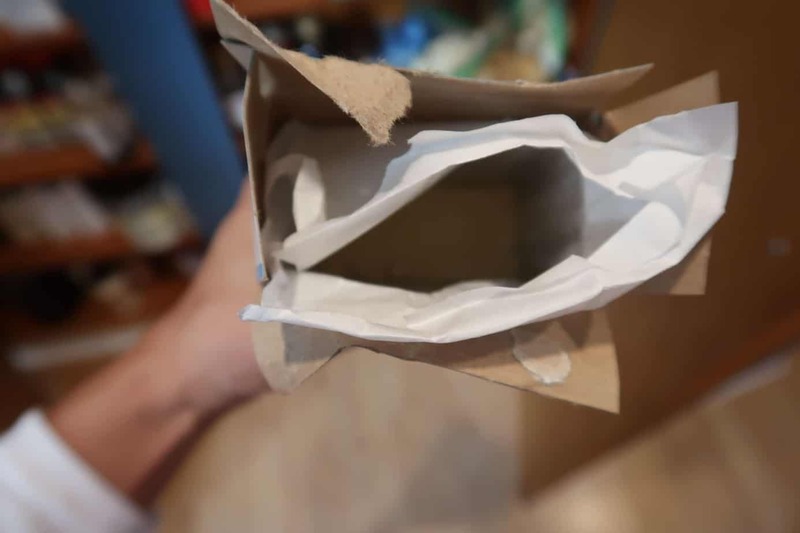 Put any of the half-opened items near the front of your pantry. You could do a separate category of items to use first within the week. Since I have an opened Jiffy corn mix and rice I’m going to add corn muffins to a chicken Mexican dish this week. Using what you have in your pantry before you go shopping is the easiest smartest way to save on your grocery bill. 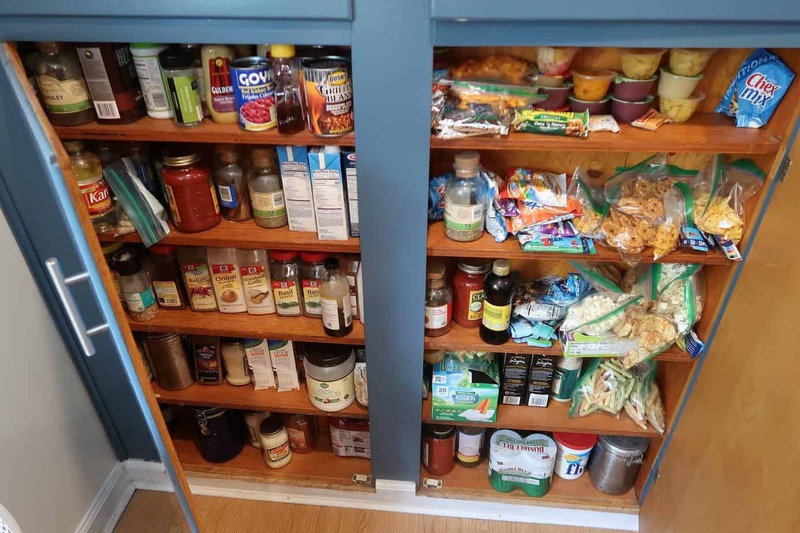 Remember when you are organizing your pantry the FIFO system. First in First Out! I have to bring in my Target Food Saftey courses. 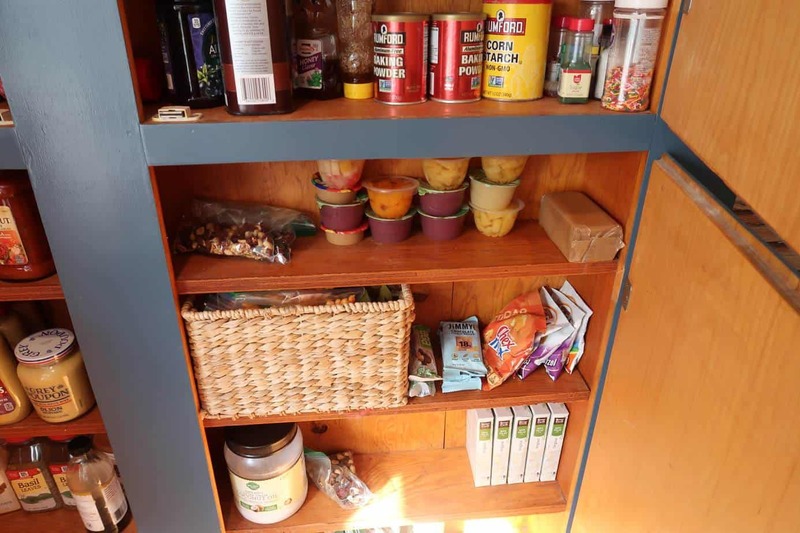 If you don’t make a plan to use your pantry items you’ll just have a pretty looking cupboard. But what is the point of that? You must come up with meals to eat from what is in your pantry. As you are organizing your pantry visualize meals you could make with items. When I am putting canned beans away I am telling myself this is an easy side dish for a busier night. 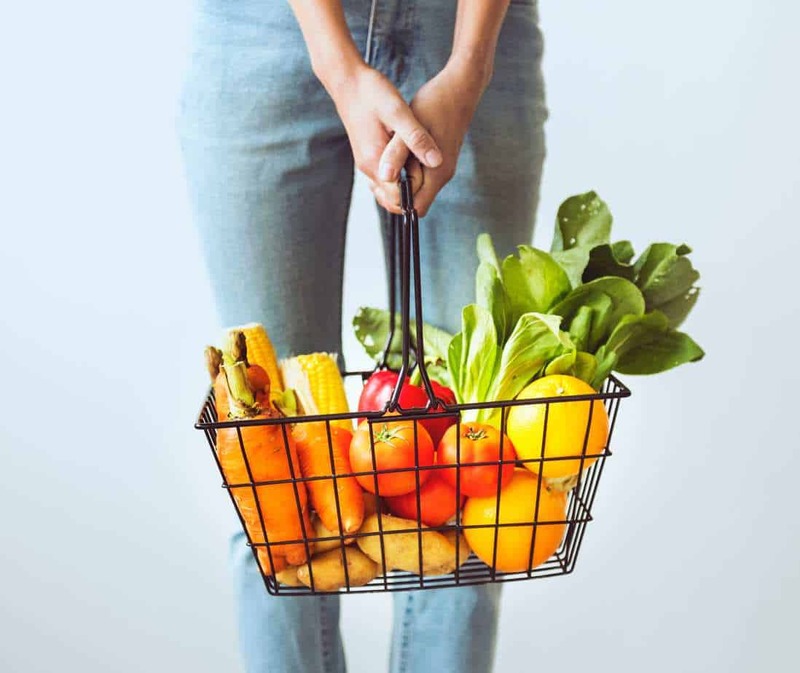 Since you already have your pantry items written down you can utilize the website MyFridgeFood where you type in all your items and recipes using those ingredients will show up! If you are at a loss with items in your pantry look to your fridge and freezer. It is always better to try to use up what you have before you shop. 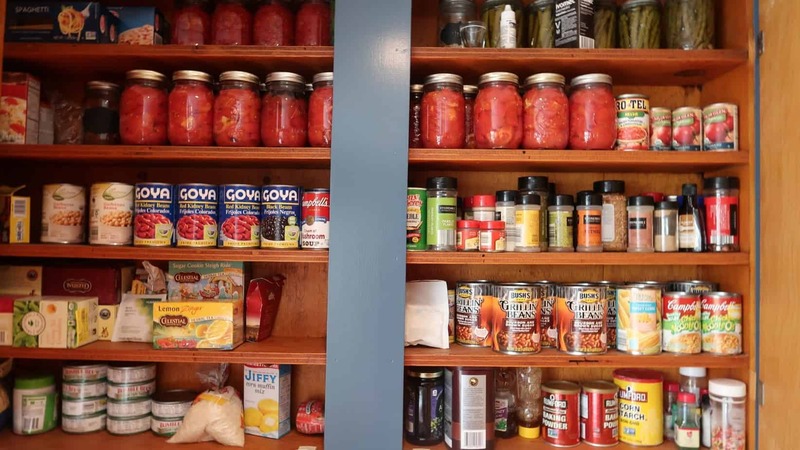 Being able to organize your pantry and use what you have will save you money on your groceries. You may come up with a week’s worth of meals, decreasing your grocery bill immediately. To really maximize your savings only buy the filler items on sale. Use a coupon matchup list to see what’s on sale and how to get the best price for the week. Don’t forget to use free grocery apps to save even more. 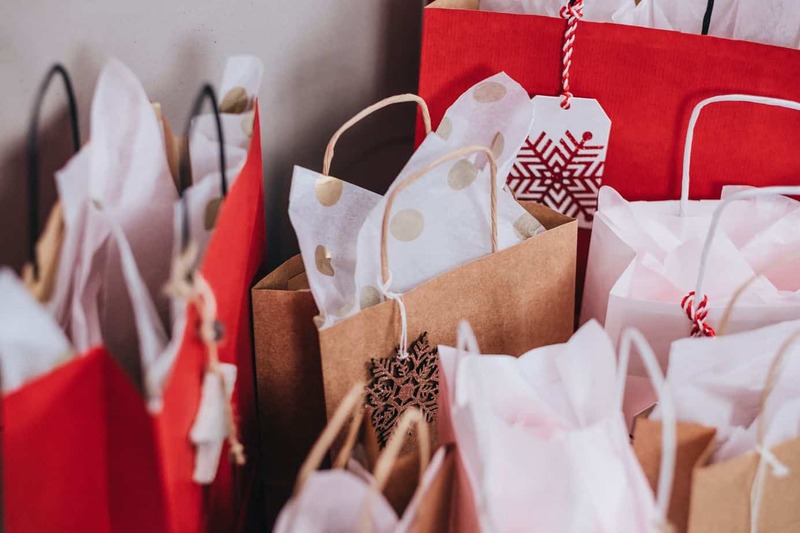 If you are choosing to shop at one store because it’s your favorite but the other store down the street has a better deal, choose the other store. Let your mindset be challenged and changed. I now only keep three of each item for the kids in the pantry. Each Sunday when I am meal planning I’ll prep the snacks and add more. Keeping my extra boxes from BJs hidden helps to keep snacks fresh. Don’t put all the snacks you bought out to keep some for variety. If your child has a favorite go for it, but otherwise keep things simple. As I plan out my two weeks of meals there are a few personal things I know I need-to-do to avoid buying pantry items. One of these for me is to not look at coupons or deal sites. I’ve come a long way from buying items that are such a good deal that I don’t really need, but it’s still a weakness and I know that. While I am saving money and using what I have I won’t go scrolling through coupons.com or the matchup lists. Making my meal menu using the items I already have I use the search tool so only that item comes up. Items I know I will be buying are fruits. Right now I will continue to use up the vegetables from our own garden. If I really need bread and don’t want to make my own- ( usually I choose this route when I am dedicated to cutting back on expenses because it’s so much cheaper) I will use the search tool here and type in bread. This way I’m focused on the one item and not being led astray by all the other Grocery items on sale for the week. Below is the meal menu I created using the items in my pantry and what I have in my Fridge/Freezer. Everyone’s menu will be different and I have more than the usual amount of meat right now in the freezer. Hunting season has begun which means we need to clear out the freezer and get ready for the new! During our really cheap times, I didn’t even buy any other meat except for venison. Here are the meals I came up with. I won’t make them in this order I’ll change it up so we don’t eat chicken soup three times a week! Coming up with all these meals excites me! I don’t have to go grocery shopping this week. I’m slowly getting out of the habit of thinking I need to grocery shop every week. This will last us longer than a few weeks, I can probably get away with this for almost a month! I still have a fair amount of snacks as you can see from the picture and the rest of the big boxes from BJs are hidden away in another cupboard. I hope to bake more now that the weather is cooling down. Are you willing to take the Pantry Spending Freeze with me? Great advice! I am guilty of having expired items and an overabundance of things that I don’t use up. I try to remind myself when I am stocking up on good deals that I am not saving money if I don’t use it. This is very good. This me. I cook what i have first then go shopping when almost on e.
Yes! It can add up so quickly. And amazes you to think how much you spend on groceries out of habit, and not necessity sometimes. Can’t wait to hear how your pantry freeze goes! Thanks for sharing it can get overwhelming. I just tried making a Lebanese split pea soup from dried peas in my pantry(first time trying them). I was lacking one fresh ingredient and substituted for dried herb and I loved split pea soup! Awesome! Hope it works out beautifully. I definately need to do this. Definitely, going to add this with the other tips for my spending freeze. Thank you. Hi Debbie, have you tried freezer meal planning? I would search Pinterest for freezer meals where they can pop in the oven or microwave. Debbie, when it is overflowing that is a great time to get started. 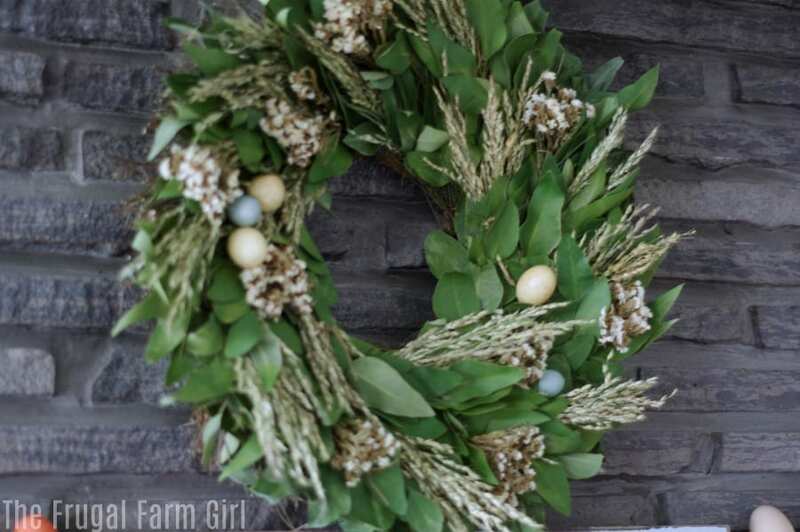 See how creative you can get and let us know how it goes. Good article. We are currently in the middle of a one month pantry challenge. Since I cook everything from scratch and also can much of our own produce, this has been fairly easy. We have also cut way back on the amount of meat we use and have given up dairy for health reasons. I am amazed at the amount of food in my house and only had to throw away one expired item. It is also probably easier for us because we have no children at home. Thanks Liz! I love canning too! I love this idea but I’m afraid it’s my DIL who loves to shop everyday!!! I want to use up the items in the cupboards and freezer but it just doesn’t ever seem to get done! My problem is the freezer is down stairs. Canned goods overflow also winds up down there. Once food goes to the basement I forget about it. But in my pantry, my worst offense is condiments as I like to make many different ethnic foods. Now instead of looking for recipes for “what’s for dinner”, I start with one of my overstock items and say “what can I make with this item”. Also trying to help my college age GS come up with easy, simple pantry meals that taste better than cafeteria meals. Good article. I have been doing this as I was unexpectdly retired due to a disability. I also cleanout the frig and make soups or casserole with smalli tems left in frig. Enjoy smoothies for breakfast using past prime fruit and yogurt. Remember beans and rice t0gether are a complete protein (cheap and EASY).